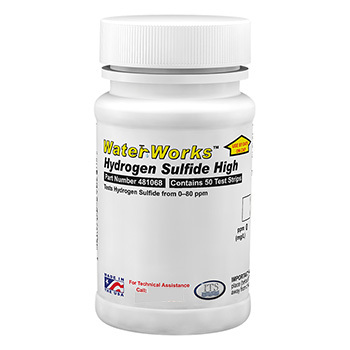 Hydrogen Sulfide Water Test strips with results under 30 seconds. No experience or laboratory equipment is needed, visual color-coded results on the spot. Simply dip a test strip in the water sample to be tested for one second, shake off excess water and compare your results to the color chart provided. Easy to use, do-it-yourself drinking water Hydrogen Sulfide Water Test Kit (also called Hydrogen Sulphide or H2S ). Also can be called "sulfur water test". If you notice a rotten egg smell from your well or tap water , this test can help you detect levels of hydrogen sulfide.